MyClosingTools.com is a web-based, computer software development application that effectively increases sales. It is especially designed for the mortgage and reverse mortgage industries to consolidate and track leads, and improve the customer's buying experience. Its counterparts are applicable to property management and real estate sales, and it is adaptable to any sales functionality. We provide faster lead response time coupled with call to action follow-up that always results in higher lead conversion. MyClosingTools.com will leverage your existing expertise while guiding your sales team with better prospecting, closing, and retention tools. Systematically collect lead referrals from all sources and telephone queries into a streamlined, simple, lead response process. Automatically import leads from high-performing lead generators such as Lender Lead Solutions and ACT!. 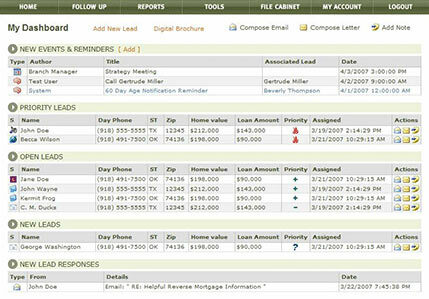 MyClosingTools.com is fully integrated with ReverseVision's reverse mortgage origination software. Diminish response time, increase closing ratios and build customer satisfaction. Written communications include targeted priority mail especially formatted and designed to accommodate both the sensitive nature of the reverse Home Equity Conversion Mortgage (HECM), and the highly competitive, classic mortgage industry. With MyClosingTools.com, your brand is automatically enhanced through response tools utilizing product identification. Be assured your Internet lead response is building your brand with excellent closing tools and refined marketing techniques. Lead sources, leads, and closing ratios are available for review 24/7 in a choice of formats. Always know how your lead sources, responses, and closings are performing. 1. Prospecting online customer analysis form, internet lead harvester and organized action plan. For more information contact, Becca Wilson at (866) 491-7500 or bwilson@spherexx.com.